In a nutshell: You pay $10 (CAD$15) for a 6-month Preferred Customer account, save up to 25% on AMSOIL products, and get FREE shipping or FLAT RATE shipping (AK & HI excluded) on your orders based on the dollar-amount ordered. Free shipping (Alaska & Hawaii excluded) on orders of $100 (CAD$130) or more. How do I get started? It's simple, Get Started Today or call us Toll Free 1-888-428-3319 and we can have you up-and-running is less than an hour. What is an AMSOIL Preferred Customer? A Preferred Customer (P.C.) account is simply a wholesale club without the "club" moniker. Individuals pay a small registration fee and purchase products wholesale for the duration of their account. What do you mean "wholesale"? Preferred Customers purchase products at a discount from the internet prices. P.C. pricing is up to 25% less than the prices that you see online. Typically, the Preferred Customer's price is quite a bit less than the price on products offered in a retail setting (shops & stores have to keep the lights on). So why become a Preferred Customer? Many individuals and families belong to Sam's Club, Costco, BJ's or other wholesale clubs to SAVE $$. It is no different with a Preferred Customer account. It's all about saving $$ PLUS having the freedom to pick up the telephone, speak with a courteous, experienced order clerk (I did not say Sales Clerk) and have your products delivered to your doorstep. Go shopping in your Garfield slippers! Preferred Customers can also place their orders online and still receive wholesale pricing. Autonomy (but not alone): As a Preferred Customer you merely order what you want, when you want it, and get it wholesale; no minimum order requirements. You call the corporate 1-800 order line and tell the clerk what you need. As for the "not alone" part well, every Preferred Customer has a sponsoring dealer that they can call for technical and administrative support. A Preferred Customer can also call the AMSOIL INC. Technical Services department for assistance with technical questions. You call them if you need assistance! They do not call you. What is a sponsor? I thought my Preferred Customer account was with AMSOIL INC.? Your Preferred Customer account is with AMSOIL INC. Each new Preferred Customer is assigned a sponsoring dealer to provide technical and administrative assistance "if you request assistance". Your sponsoring dealer will normally call or email you once as a courtesy introduction and after that it is up to you to call your sponsor if you need assistance. Am I locked in? The short answer is NO. NO. NO. When your account ends you have an option to renew. If you do not call and personally renew (or establish auto renew) your Preferred Customer account goes dormant. When you call-in your next order you can renew your account and continue to receive P.C. pricing. When my account ends? How long does my wholesale account last? Preferred Customer accounts are for set periods. Normally six-months, one-year or longer; you select the account length that fits your situation. Many customers start with a six-month account to get their first order wholesale and “see what it’s all about” and then renew for longer terms (or elect "auto renew" and save $). Factory-direct? How long does it take to get to me? This is a great question. AMSOIL has eleven (11) distribution centers (DC) in the USA and two (2) in Canada. Let's say you live in Las Vegas and all of your products are at the DC, you'll probably have your order the next day. No promises on next day delivery but it does not take too long. Now, if you order a tote (275 gallon container) of biodegradable hydraulic oil, it might take a few weeks since these are packaged at the factory and shipped when ordered. Back to Las Vegas; if you live in Las Vegas, or any of the other cities with a DC, then place your order and drive over to the DC and pick up your order (no freight). NOTE: The individuals at the distribution centers are professionals and they are good at what they do. Their mission is to get your order processed and your products shipped ASAP. Final TidBit: Preferred Customer accounts are for anyone that wants to experience purchasing high quality products factory-direct wholesale. If your crystal ball says that you will probably purchase at least a $100 or so per year in AMSOIL products then your checkbook will appreciate an annual Preferred Customer account. If your crystal ball is fuzzy on future purchases, then try a six-month trial Preferred Customer account and see where that takes you. Okay, so how much? A six-month trial account is $10 (CAD$15) (the trial accounts can only be established once and last for six-months). One-year accounts are $20 (CAD$30) and can be renewed indefinitely. You can elect to "auto renew" and receive a 20% discount on your membership. NOTE: We chose 20W-50 motorcycle oil for this example. 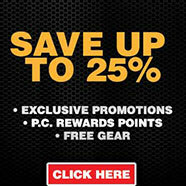 The AMSOIL Preferred Customer savings apply to products across the board. Without a Preferred Customer account individuals can purchase a case (12 qts) of 20W-50 synthetic motorcycle oil (MCV) factory-direct on the internet (catalog) for $161.45 + sales tax and you get free shipping. To make it easy, let's say that you live in New Hampshire where there is no sales tax. $161.45 goes on your VISA and your case of oil is delivered to your doorstep. So far so good? With a six-month Preferred Customer account (USA), that same case of 20W-50 synthetic motorcycle oil (MCV) is $116.90 + no NH sales tax + $0 freight + $10 six-month account fee. (April 2018 pricing shown). In this case, including the Preferred Customer account fee, $126.90 goes on your VISA and your oil is delivered to your doorstep. It gets better - Let's say you and your friends blow through that case of 20W-50 in a couple of months; if you order another case of MCV within the six-month account period the second case (freight and all) lightly touches your VISA for $116.90 and your case of oil is delivered to your doorstep. No account fee on subsequent orders within the account period (six-months in this example). So, if your mind is made up and you want to buy a case of AMSOIL synthetic 20W-50 motorcycle oil and have it shipped to your doorstep, the choices are: $161.45 (retail pricing) or $126.90 (includes the $10 account fee). Which is better? How do I get started? Simple! Register Online Today. If you prefer to speak with a human to get more information first, call us Toll Free 1-888-428-3319 and we will answer your questions, establish your wholesale account, and have you ready to save $$ in a few minutes.